Queen Victoria which is operated by Cunard Line has set sail on its world cruise not long after its major refurbishment in Hamburg, Germany. The 90,000 gross ton ship showed off its new look for the first time while setting sail on its world cruise. It isn’t just any world cruise, it’s the 175th Anniversary world cruise and Cunard Line is celebrating in style. 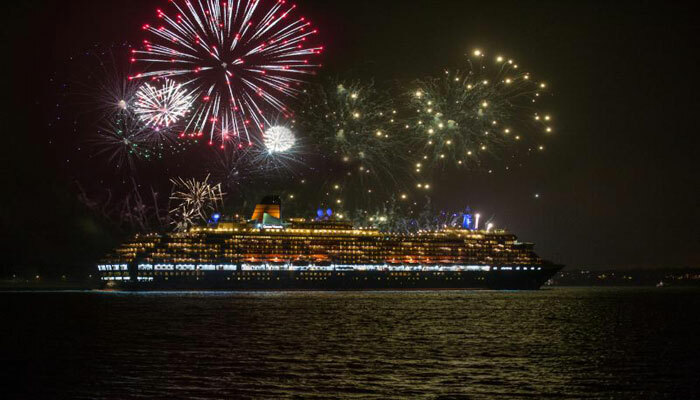 Queen Victoria was given a spectacular send off under a fire works display in Southampton Port. The vessel had only just completed its huge upgrade where it spent 20 days at the Blohm & Voss shipyard in Hamburg. Nine brand new single staterooms were installed as part of the refurbishment. In addition to refreshing existing furnishings, enhancements have been made to the outdoor spaces, beverage provision in the ship’s informal Lido restaurant and eight brand new internet stations have been installed on the upper floor of the library. 2,000 contractors representing thirty different nationalities worked a total of 600,000 man hours around the clock to replace all 215,278 square feet of carpet in the passenger areas. They also renewed all 3,167 mattresses on board and replaced over 19,685 square feet – 3.75 miles – of pipe work insulation. 2,695 gallons of paint were used inside and out, enough to paint 54 Boeing 737’s. “The results of Queen Victoria’s refit are a true testament to Cunard’s ability to respond to passenger input. We are delighted to incorporate their wish for more outdoor space with enhancements to the Upper Grill Terrace and additional areas for sunbathing. We also provided more single staterooms for our single travelers. It’s this commitment to our passengers that keeps Cunard’s 175 year heritage going strong,” commented Rick Meadows, President of Cunard, North America. In honour of the company’s anniversary, Queen Victoria welcomed her World Voyage passengers aboard with a commemorative flag-raising ceremony which took place at the ship’s mast. This was to hoist the signature flag for the first time on board and as is traditional, was performed by the youngest crew member, 20 year-old deck cadet Fraser Browne. The flag will be flown at iconic landmarks across the world during all three of the fleet’s World Voyages and will be auctioned at their conclusion with all proceeds going to The Prince’s Trust, Cunard’s official charity. The ship’s first call will be Ponta Delgada in the Azores on 23 January before she sails to the Caribbean, transits the Panama Canal and heads for Hawaii and Australia.